Steven (Chicagoland, United States) on 31 March 2015 in Architecture and Portfolio. 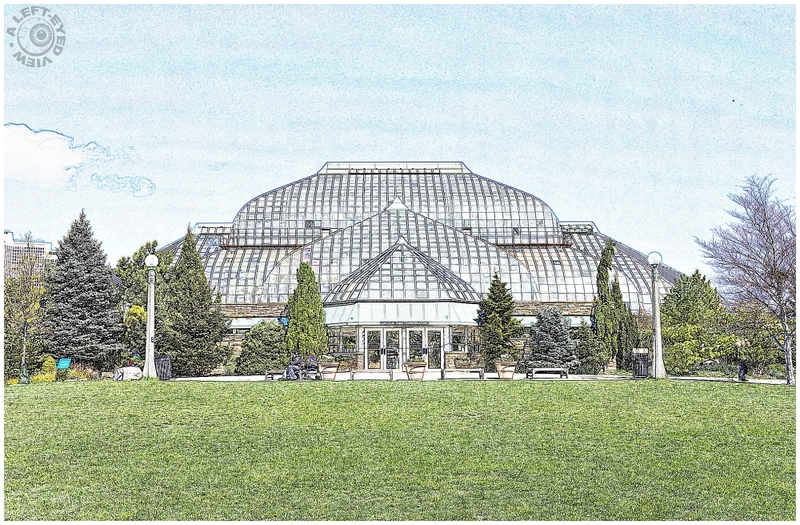 The conservatory was built in stages from 1890-1895. It consists of a vestibule, four display halls and fifteen propagating and growing houses. The vestibule and Palm House were built and opened to the public in 1892 and contain giant palms and rubber trees, including a 50-foot fiddle-leaf rubber tree planted in 1891. In the Palm House, one can also find Garden Figure, a sculpture by Frederick Hibbard. The Fern Room or Fernery, approximately five and a half feet below grade, was opened in 1895. It contains plants of the forest floor, primarily a vast collection of ferns. The Tropical Room was originally called the stove house. Opened in 1895, it contained an assortment of tropical plants suspended from bark-covered walls. It is now called the Orchid Room and has a collection of approximately 25,000 natural species. The Display House is used for seasonal flower exhibits. Processed using the colored pencil filter of PhotoScape. Photo captured April 9, 2012. Interesting tecnique, good job indeed! Excellent composition and I like the vintage look of the processing. Interesting information as well. Quelle esquisse sueprbe iamge et compo avec ce pré vert mervielleux. A fine image of this eye-catching building. It was interesting to read how long this conservatory has been open to the public. Un traitement qui met en valeur la beauté de l'architecture. Splendide! A treatment that showcases the beauty of the architecture. Splendid! Excellent composition with an original post processing. Interesting information too. The architecture is just gorgeous! What a beautiful building! I love the pencil effect. It is very pretty. Great info on this conservatory.... and I like the processing .... very impressive! That is a fabulous building.